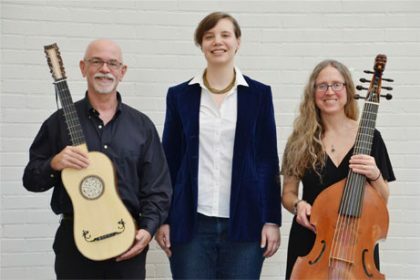 Save the date for Saturday night, March 9, at 7:30, when we’ll once again be hosting a gala benefit concert of delightful Early Music to benefit All Souls programs and The West Village Meeting House. Thanks to Kay and Turner Lewis, whose daughter and son-in-law are two-thirds of Night‘s Black Bird, we are being gifted with a performance that we expect will prove a draw for the region’s Early Music fans, who tend to flock devotedly to such offerings. Last year’s performers included Katherine Kaiser, soprano; Elizabeth Conner, bass viola da gamba; and Ted Conner, lute and baroque guitar—all with impressive academic credentials and performance experience with numerous ensembles. A gala reception will be offered, and admission at the door is set at $15 per person. Joy Wallens-Penford and Kay Lewis plan to provide their favorite specialty desserts, but other All Souls folks are welcome to contribute other desserts, or better yet, options in the savory appetizer category (nice cheeses, dips, etc. ), fruit plates, and so on. Let Joy know what you are able to do by sending an email to momjoy@sover.net or calling her at (802) 257-2616 so she can fill in any gaps. Any leftovers will be enjoyed during Coffee Hour the next morning.